Slowly, Manhattan returns to normal. I came back Thursday early in the morning with a bus from Boston to Chinatown (JFK was open, but no no flights from Europe were arriving). Midtown is ok; Chinatown however was dark and scary, like one of those Hollywood-movies where Manhattan is destroyed, Cloverfield, The Day After Tomorrow, Batman, I‘m Legend, you name it. The only thing missing was the monster lurking in the corner (or maybe not, I swiftly escaped by taxicab). Crossing 39th Street was like diving in another world, with light, warmth, and music. The Downtowners are now flocking our supermarkets. Buses are running, but not very reliable. The subway and tunnel damage is huge; this is worse than 9-11. Thanks God a lot less people died. It is still tough in Staten Island, New Jersey, and parts of the coast, however. Tomorrow I will visit friends in Rockaway beach to see how they are doing. This brings me to the next point: In these days, everybody needs a guardian angel. And you can get your own guardian angel, as a T-shirt, a necklace, or a book. 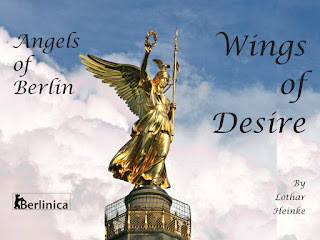 So, listen to the music and watch the angels of Berlin spread their wings, and let them help protect you!